The importance of electrical checks and the 25% who don’t! Here’s a shock – over 30% of homes in the UK have never had any electrical checks carried out by a qualified electrician. Plus, up to 25% of homeowners have had an electric shock in their own home! It maybe time to find a Which? Trusted Trader. 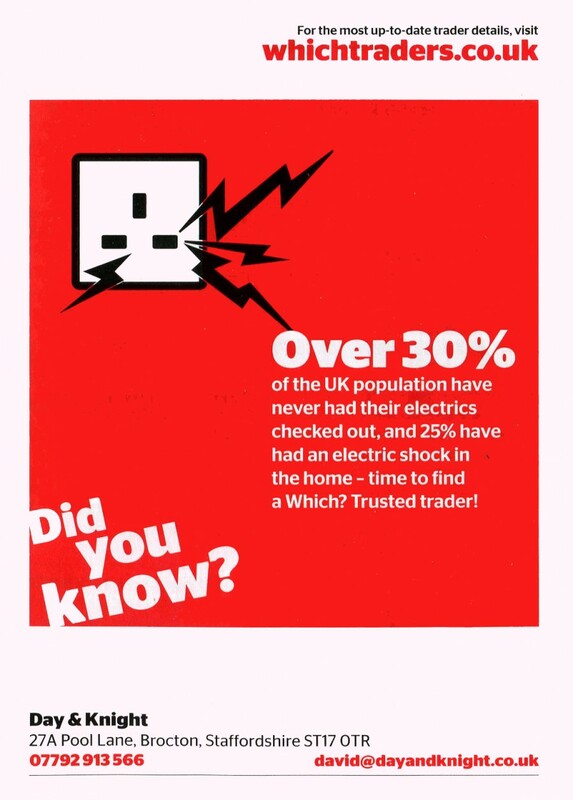 If you’re included in that percentage, or even if you’re not, don’t you think it’s time to make sure your electrics are up to scratch by calling a qualified electrician in your area? Day & Knight Electrical Solutions are qualified and reliable, based in the Stafford area, with over ten years of experience in making your electrics safe. Customer feedback cards are collected from all customers to make sure a quality service is provided at all times – and that includes your electrical checks. For a free quotation call us today on 01785 661199 or 07792 913566. Any business signed up to the scheme must agree to abide by the code of conduct before they can tell their customers they are an endorsed Which? Trusted Trader. If you wish to organise an appointment for a full electrical checks service for a domestic or commercial property, please call 01785 661199 or 07792 913566 today or complete the contact form here. This entry was posted in Domestic and tagged electrician stafford, Stafford electrician, WHICH?, Which? trusted trader.